"We were able to agree on a two-year term for a dollar figure that works well for me and they were happy with it as well," said Marchant of re-signing with Anaheim in the offseason. "My family and I are just happy to be a part of the Ducks family for the next two years." 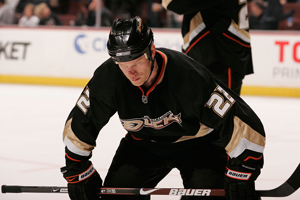 There were days during the final two months of the 2008-09 season where Todd Marchant would enter Honda Center with a walking boot on his left foot. That was the only evidence possible that he was playing through an injury. You certainly could not tell from his performance on the ice. The fiery veteran was an integral part of Anaheim’s playoff run, which saw the team go 10-2-1 to close out the regular season before eliminating top-seeded San Jose and putting a scare into Detroit. Marchant, as he customarily has done since joining the team in 2005, did all little things to help the Ducks during that time. He manned the center position on the checking line, sacrificed his body on the penalty kill and provided constant leadership in the locker room. He also found the scoresheet in a big way, scoring one of the most memorable goals in club history when he beat Chris Osgood for the game-winner in the third overtime of Game 2 at Detroit. Once the offseason came, Marchant finally had foot surgery and then faced an uncertain future with the Ducks as an unrestricted free agent. The team addressed him as one of its priorities in a busy summer and after a week being on the market, he was inked to a two-year deal on July 7. The newly-turned 36-year-old (birthday is August 12) returned to Orange County recently from his offseason home in Buffalo. One of just eight players remaining from the 2007 Stanley Cup championship team, Marchant took some time out from his preparation for the upcoming season to discuss several different topics. How was your offseason away? Do you spend most of it in Buffalo and when did you get back into town? The offseason was really nice. I got to spend a lot of time with my family and my kids. We headed back east to Buffalo when the kids got out of school at the end of June. We got back here about a week ago. It’s business as usual for my family and I now and I’m looking forward to the new year. "Some of us, who have been there before, it was like you got that taste back in your mouth," said Marchant of last season's playoff run. I'm looking forward to a new season. We can definitely draw similarities to the 2005-06 and 2006-07 teams." Did you keep in contact with any of your teammates during the offseason? Yeah, absolutely. I would talk to somebody probably once a week, not only current players, but former players as well. Obviously, it was a busy offseason for our team. Most people probably had no idea you were injured during the final months of the season. How was it dealing with the foot then and how is it feeling now after surgery? At the end of the season, the training staff felt it would be prudent to get a further examination. We had a CT scan and it showed that I had a fracture of the navicular bone in my left foot. The idea was to just lay low for a couple of weeks and see if the bone would heal on its own. Playing at the level that we were on a daily basis didn’t give it ample time to heal. Really at the end, it wasn’t bothering me too much, as it was in the beginning. After two weeks, I went in and had another CT scan and it showed there was no healing happening. The doctor’s recommendation was to perform the surgery. They inserted a small screw into the bone to close the gap and allow it to heal quicker. I went in the beginning of June. I was on crutches for at least six weeks, so that wasn’t a lot of fun. After the six weeks, I started my therapy and as of today, I’m doing everything that I’m supposed to be doing. I’m skating at the same level I was and have had no setbacks or problems. It was definitely the right thing to do at the right time. You couldn’t even tell when you were skating. Did the foot ever pose a problem on the ice? It hurt more to be off the ice than it on the ice to tell you the truth. When your foot is in the boot, it’s stable. Your foot does move a little bit, but it’s stable. The only time I had a problem was usually the day after a game. It would bother me going back on the ice, especially after I originally hurt it at the end of March (following a slap shot against Phoenix on March 22). There were a lot of practices that I didn’t make or didn’t go out for. In all honestly, I’ve had worse injuries. I was pretty shocked to find out that it was still broke after the season. At that point, it didn’t really bother me at all. I guess I got used to it. I’m glad that we caught it and got it taken care of. The training staff and the doctors did a great job. I’m looking forward to a new season. In a busy offseason for the Ducks, you signed a new two-deal with the team on July 7. What does it mean for you to come back to Anaheim? We had talked to the Ducks briefly before July 1. The Ducks preferred to give me a one-year deal and I was looking for two. July 1 came and went and I got to speak to other teams. We found that there was an interest in me out there in the league and the interest was a two-year deal. My family and I really enjoy living here and like being part of the Anaheim Ducks family. We felt we owed it to them to go back and say ‘Is there any way we can get a two-year deal done?’ Bob Murray, David McNab and the group, we worked through it together. We were able to agree on a two-year term for a dollar figure that works well for me and they were happy with it as well. Again, my family and I are just happy to be a part of the Ducks family for the next two years. ""I'm more of a guy that likes to talk in the dressing room, talk to the guys and do all the little stuff in the dressing room that helps things move along," Marchant said. "I think if everyone does a little bit, it adds up to a lot." Looking back at last season’s playoff run, what you remember most from that time? What I remember most is how our team came together after the trade deadline. You look at our team and you look at the turnover that we’ve had since, let’s just go back to when we won the Stanley Cup. The turnover is unreal, the amount of players that have come in and come out. I think that what I look back on most is the fact that we took a group with new faces and came together as a team at the right time. We didn’t have the regular season that we wanted to, but we gave ourselves the ability to get back into the playoff race. We went on an unbelievable stretch to finish the season just to get in the playoffs. We went into the playoffs on a high note, winning hockey games. We went up against the best team in the National Hockey League, record-wise, and we knocked them off in six games. Then, we took the Detroit Red Wings, who were the second-seeded team in the Western Conference to a Game 7 and arguably could have very well beaten them. I think that part is what I remember most, how it all came together so quickly. You’re talking about five, six, seven, eight new faces into the dressing room, which have new personalities and new styles of play. I’m just hoping now that we’ve got even more new faces on the team that we can pick up where we left off, so we can get back to where we want to be, which is winning the Stanley Cup. Do you see similarities in this team to the one that entered the 2006-07 season, eager to expand upon the results from the 2005-06 club? That is the one thing that I mentioned to Bob Murray. This may be the best thing that could have happened to us. Maybe we’ll look at this and say we got a taste of it. It’s like a young player from the minors getting called up, getting a taste of the NHL and then getting sent back. He’ll go back and say ‘I want that every day’. I think that for us, getting a little bit of playoff success, we got a taste of what it was like. Some of us, who have been there before, it was like you got that taste back in your mouth. I want to be a part of that every year. Whether it happens or not remains to be seen, but we can definitely draw similarities to the 2005-06 and 2006-07 teams. "The pieces to the puzzle are there," Marchant said. "It’s a question of putting it all together and getting everything to come together at the right time. It’s not a race. It’s a marathon. It takes time and it will all start on September 12, when we come together for training camp." 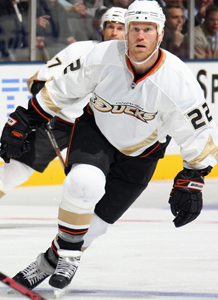 You have been one of the unquestioned leaders of the team in the locker room throughout your time in Anaheim. Do you think you will have to have an even bigger leadership role with the departure of Chris Pronger? I believe that you have to, first and foremost, take care of your game and yourself. The way that you carry yourself, it breeds success. Other guys will feed off that. They’ll see that and they’ll follow. Scott Niedermayer is a perfect example. Scotty’s not a rah-rah guy. He leads by example. I’m more of a guy that likes to talk in the dressing room, talk to the guys and do all the little stuff in the dressing room that helps things move along. 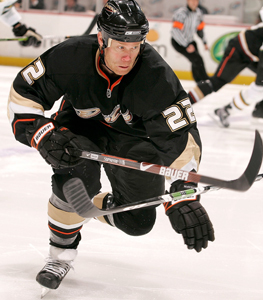 We’re bringing in guys like Saku Koivu, who spent 10-plus years as the captain of the Montreal Canadiens. You don’t get much more leadership than that. Then, you look at young players. 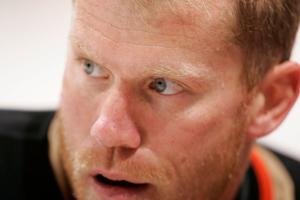 Look at a guy like Corey Perry. Here’s an example of a guy who can take the next step in a leadership role and help some of the younger guys below him increase their game. I think if everyone does a little bit, it adds up to a lot. It’s the old cliché, we don’t need anybody to play great tonight, we need everyone to play good. That is the way we have to approach the season. From Scott Niedermayer returning to re-acquiring Joffrey Lupul and signing Koivu, what do you think of the offseason moves made by the Ducks? Our top two lines have enough talent and scoring power to provide that offense. The bottom two lines have grit, speed and toughness to provide that energy. Our defensive core is as strong as it has ever been. Goaltending is a non-issue for us because we have two very capable goaltenders. The pieces to the puzzle are there. It’s a question of putting it all together and getting everything to come together at the right time, from chemistry to injuries and all those things that go on during an entire NHL season. It’s not a race. It’s a marathon. It takes time and it will all start on September 12, when we come together for training camp. The Western Conference will be strong yet again. Where do you see this team stacking up with the competition? If you look at the West, the experts are going to look at San Jose, Detroit and Chicago, with the offseason moves that they made. St. Louis is making its way up. They are going to be a strong team. But you know what, I’m just fine with them not talking about us or not saying they expect us to be a top team. We’ll go about our business quietly on the West Coast, as a Southern California team, and we’ll see where we end up at the end of the season.